Court in Egypt sentences 78 youth, aged 13 to 17, to up to five years in prison for protesting with the Muslim Brotherhood. A court in Egypt on Wednesday sentenced 78 youth to up to five years in prison for protesting with the Muslim Brotherhood, the BBC reports. 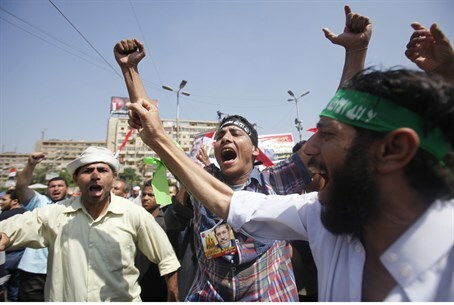 The boys, from 13 to 17 years old, joined rallies calling for the return of ousted President Mohammed Morsi. State media reported that the boys were arrested for "participating in protests calling for the downfall of the regime". The protests "blocked roads" and "terrified citizens" said the state agency MENA. The boys' lawyer, Ayman El-Dabi, said that some of the boys had not been protesting and had just been "in the wrong place". The authorities have cracked down on Islamists since Morsi was removed by the military in 2013. Since that time, thousands of his supporters have been killed and arrested and the Muslim Brotherhood was declared a terrorist organization. Death sentences on 528 supporters of President Morsi were handed down at a mass trial in March. In April, another 683 supporters of Morsi, including leading members of his Muslim Brotherhood, were sentenced to death as well. The prosecution of a further 919 suspected Islamists was ordered by the authorities in two separate trials in the same month. The rise of mass convictions in Egypt has been described by the United Nations as "unprecedented". The United States and the European Union have decried the mass convictions as well, but Egypt rejected the criticism, terming it “unacceptable interference in the judiciary affairs”.